1744: he goes with his family to Edo. He becomes disciple of the star Segawa Kikunojo I, who gives him the name of Segawa Kingo. 1st lunar month of 1745: Kingo makes his first appearance on stage, at the Nakamuraza, playing in the new year drama "Hagoromo Kotobuki Soga". 1751: Kingo goes back to Kyôto. Fall 1754: Kingo goes to Edo. 11th lunar month of 1754: Segawa Kingo takes the name of Segawa Kinji at the Ichimuraza, playing in the kaomise drama "Keisei Asakusa no Kane". 1755 ~ 1756: he stops acting and works for the tea house Ineya, managed by his elder sister in the district of Takanawa. 1756: he is back in the theater world, becoming a disciple of Ichikawa Danjûrô IV, who gives him the name of Ichikawa Takejûrô. 11th lunar month of 1762: he becomes disciple of the actor Matsumoto Kôshirô III, who gives him the name of Ichikawa Somegorô I during the kaomise program "Nagi no Ha Izu no Sugatami", which is staged at the Nakamuraza. 2nd lunar month of 1763: Somegorô plays in the same theater the roles of Hôjô Gorô, Tamaya Shinbê and Soga Jûrô Sukenari in Kanai Sanshô's new year drama "Momo Chidori Ôiso Gayoi". 11th lunar month of 1763: Ichikawa Somegorô I takes the name of Ichikawa Komazô II at the Nakamuraza, playing the role of Izumi no Saburô in the kaomise drama "Daijôbu Takadachi Jikki". 5th lunar month of 1764: Komazô plays in the same theater the role of Sakuramaru in the drama "Sugawara Denju Tenarai Kagami"; the roles of Matsuômaru and Umeômaru are played by Ichikawa Danjûrô IV and Ichikawa Raizô I. 1st lunar month of 1766: Komazô plays at the Nakamuraza the roles of Ômi no Kotota and Kawazu in the new year program "Kaidô Ichi Izu no Harugoma". 5th lunar month of 1766: Komazô plays in the same theater the role of Danzaburô in the drama "Yaoya Oshichi Koi no Edozome". 8th lunar month of 1766: Komazô plays in the same theater the roles of Date no Yosaku and Keimasa in the drama "Koi Nyôbô Somewake Tazuna". 11th lunar month of 1766: Komazô plays at the Nakamuraza the role of Utô Bunji, disguised as a tea seller, in the kaomise drama "Kogane no Hana Kaijin Aramusha". His stage partners in the roles of the two rebels Abe no Sadatô and Abe no Munetô, Bunji's wife and Hachiman Tarô Yoshiie (Abe clan ennemy) are Kirishima Gizaemon I, Matsumoto Kôshirô III, Yoshizawa Sakinosuke III and Bandô Hikosaburô II. 1st lunar month of 1767: Komazô plays in the same theater the roles of the tedai Matsuwakaya Shirobê, Mioya, Soga Jûrô and Yodoya Tatsugorô in the new year program "Hatsu Akinai Ômise Soga". He also replaces Ichikawa Raizô I, who falls suddenly ill, in the role of Honmachi no Tsunagorô. 7th lunar month of 1767: Komazô plays in the same theater the roles of Satô Shirobê Tadanobu and the fox Genkurô in the drama "Yoshitsune Senbon Zakura"; his stage partner in the role of Shizuka Gozen is Nakamura Matsue I. 11th lunar month of 1767: Komazô plays at the Nakamuraza the roles of Nitta Yoshisada and Nagahama Shinzaemon in the kaomise drama "Taiheiki Shizu no Furisode". 1st lunar month of 1768: Komazô plays in the same theater the roles of Shigetada, Soga Jûrô and Minoya Kichibei in the new year program "Fude Hajime Soga no Tamazusa". His stage partners in the roles of Soga Gorô and Kudô Saemon Suketsune are Ichikawa Yaozô II and Ichikawa Danjûrô IV. 4th lunar month of 1768: Komazô plays in the same theater the role of Karigane Bunshichi in the otokodate drama "Otokodate Itsutsu Karigane". His stage partners are Nakamura Sukegorô II (Kaminari Shôkurô), Matsumoto Kôshirô III (Gokuin Sen'emon), Arashi Otohachi I (Hotei Ichiemon) and Ichikawa Yaozô II (An no Heibei). He also plays the roles of Ono no Tôfû, Sakuramaru and Monogusa Tarô in the dramas "Ono no Tôfû Aoyagi Suzuri", "Sugawara Denju Tenarai Kagami" and "Monogusa Tarô". 8th lunar month of 1768: Komazô plays in the same theater the role of Hosokawa Katsumoto in the drama "Tenjiku Tokubê Kokyô no Torikaji", whose plot and characters belong to the "Tenjiku Tokubê" world. His stage partners in the roles of Tokubê, Tokubê's wife and Harimanosuke are Ichikawa Danjûrô IV, Yoshizawa Sakinosuke III and Ichikawa Yaozô II. 11th lunar month of 1768: Komazô plays at the Nakamuraza the roles of the shamisen player Kichiroku and Suruga Hachirô in the kaomise drama "Ima o Sakari Suehiro Genji", which celebrates the arrival in Edo of the Kamigata star Nakamura Utaemon I and the shûmei of Osagawa Tsuneyo II. 1st lunar month of 1769: Komazô plays in the same theater the role of Shigetada in the new year program "Soga Moyô Aigo no Wakamatsu". 2nd lunar month of 1769: Komazô plays in the same theater the role of Oniô Shinzaemon in the dance drama "Sugatami Asama-ga-Dake". 7th lunar month of 1769: Komazô plays in the same theater the roles of Chihara Sakon, Shinoda Saemon and Sasaya Jûbê in the drama "Nenriki Yuzuriha no Kagami". 11th lunar month of 1769: Komazô plays at the Nakamuraza the role of Sano Genzaemon in the kaomise drama "Kawaranu Hana Sakae Hachinoki". 1st lunar month of 1770: Komazô plays in the same theater the role of Soga Jûrô Sukenari in the new year sogamono "Kagamigaike Omokage Soga". His stage partners in the roles of Soga Gorô Tokimune, Kudô Saemon Suketsune and the courtesan Ôiso no Tora (Jûrô's lover) are Ichikawa Yaozô II, Nakamura Nakazô I and Nakamura Matsue I. His son makes his first appearance on stage, receiving the name of Ichikawa Sumizô I. 11th lunar month of 1770: great shûmei at the Nakamuraza. Ichikawa Danjûrô IV takes back the name of Matsumoto Kôshirô II, Matsumoto Kôshirô III becomes Ichikawa Danjûrô V, Nakamura Shichisaburô II takes the name of Nakamura Shôchô and Ichikawa Benzô I received the name of Ichikawa Monnosuke II. Komazô plays the roles of Minamoto Yorimasa and Hanamori Kisuke in the kaomise drama "Nue no Mori Ichiyô no Mato". 1st lunar month of 1771: Komazô plays in the same theater the roles of Soga Jûrô Sukenari, Sukebei and Mionoya in the new year sogamono "Sakaichô Soga no Nendaiki". His stage partners in the roles of Soga Gorô Tokimune, Kudô Saemon Suketsune and the courtesan Ôiso no Tora (Jûrô's lover) are Ichikawa Danjûrô V, Nakamura Nakazô I and Iwai Hanshirô IV. 3rd lunar month of 1771: Komazô plays in the same theater the role of Hanbei in the Miyakoji-based dance-drama "Oborozuki Tsui no Someginu", which puts in the same michiyuki the couples of lovers Tokubê/Ohatsu ("Sonezaki Shinjû"), Ochiyo/Hanbei ("Shinjû Yoi Kôshin") and Osome/Hisamatsu; the role of Hanbei's lover Ochiyo is played by Yamashita Kinsaku II. 4th lunar month of 1771: Komazô plays in the same theater the role of Ôboshi Yuranosuke in the drama "Kanadehon Chûshingura". His stage partners in the role of En'ya Hangan, Kô no Moronô, Kakogawa Honzô and Okaru are Ichikawa Yaozô II, Ichikawa Danjûrô V, Nakamura Nakazô I and Nakamura Matsue I. 7th lunar month of 1771: Komazô plays in the same theater the role of Hamanari in the drama "Tamura Maro Nanae Gasane". 11th lunar month of 1771: Komazô plays at the Nakamuraza the role of Ariwara no Yukihira in the kaomise drama "Kuni no Hana Ono no Itsumoji". His stage partners in the roles of Matsukaze and Murasame, two pearl-diving sisters in love with Yukihira, are Nakamura Nakazô I and Iwai Hanshirô IV. 1st lunar month of 1772: Komazô plays for the first time, in the same theater, the role of Kudô Saemon Suketsune in the new year sogamono "Haru Soga Akebono no Zôshi". His stage partners in the roles of Soga Gorô Tokimune and Soga Jûrô Sukenari are Ichikawa Monnosuke II and Ichikawa Yaozô II. 2nd lunar month of 1772: the Nakamuraza is completely burned in a big fire. There is no performance up to the 8th lunar month. 11th lunar month of 1772: great shûmei at the Nakamuraza. Matsumoto Kôshirô II, Ichikawa Komazô II and Matsumoto Sumizô I respectively take the names of Ichikawa Ebizô III, Matsumoto Kôshirô IV and Ichikawa Komazô III. Kôshirô plays the roles of Yoshigorohachi and Sagami Jirô in the kaomise drama "Ôyoroi Ebidô Shinozuka". 1st lunar month of 1773: Kôshirô plays in the same theater the roles of Soga Jûrô Sukenari, the priest Seigen and Kyô no Jirô in the new year sogamono "Wada Sakamori Eiga Kagami". His stage partners in the roles of Soga Gorô Tokimune, Kudô Saemon Suketsune and the courtesan Ôiso no Tora (Jûrô's lover) are Ichikawa Yaozô II, Nakamura Denkurô II and Sanogawa Ichimatsu II. 5th lunar month of 1773: Kôshirô plays in the same theater the role of Katsukawa Harumoto in the drama "Dainippon Ise no Kamikaze". 7th lunar month of 1773: Kôshirô plays in the same theater the role of Asama Saemon in the drama "Keisei Kataokayama". 9th lunar month of 1773: Kôshirô plays in the same theater the role of Matsuômaru in the drama "Sugawara Denju Tenarai Kagami". His stage partners are Nakamura Shôchô (Kan Shôjô), Ichikawa Monnosuke II (Sakuramaru), Bandô Matatarô IV (Umeômaru), Ôtani Tomoemon I (Matsuômaru's father Shiratayû), Nakajima Mihoemon II (Matsuômaru's master Fujiwara no Shihei) and Yoshizawa Sakinosuke III (Matsuômaru's wife Chiyo). 11th lunar month of 1773: premiere at the Nakamuraza of the play "Gohiiki Kanjinchô", performed as a kaomise drama. 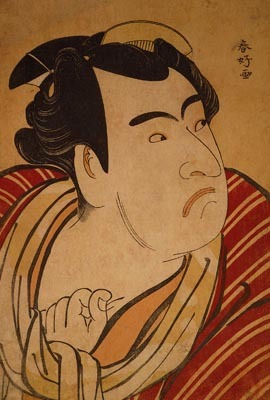 Kôshirô plays the roles of Minamoto Yoshitsune and Izumi Saburô [casting]. This 46-days long performance, which is also the shûmei of Nakamura Rikô I, is a tremendous success. 1st lunar month of 1774: Kôshirô plays in the same theater the roles of Soga Jûrô Sukenari and Shigetada in the new year sogamono "Oatsuraezome Soga Hinagata". His stage partners in the roles of Soga Gorô Tokimune, Kudô Saemon Suketsune and the courtesan Ôiso no Tora (Jûrô's lover) are Ichikawa Monnosuke II, Ichikawa Danjûrô V and Nakamura Rikô I. A "meeting in the darkness" scene, which is played by Nakamura Nakazô I, Ôtani Hiroji III, Nakamura Rikô I and Kôshirô, is particularly well received by the audience. 3rd lunar month of 1774: Kôshirô and Iwai Hanshirô IV perform together the roles of Onatsu and Seijûrô in the same theater in the michiyuki "Nushiyatare Koi no Yamabuki". 5th lunar month of 1774: several actors, including Ichikawa Ebizô III, Ichikawa Danjûrô V, Iwai Hanshirô IV and Kôshirô leave the Nakamuraza. 11th lunar month of 1774: Kôshirô moves to the Moritaza and plays the roles of Matsuura Saemon and Satô Tadanobu in the kaomise drama "Ichi no Tomi Tsuki no Kaomise". His stage partners in the roles of Shizuka Gozen and Minamoto Yoshitsune are Iwai Hanshirô IV and Bandô Mitsugorô I. It is said that Kôshirô, portraying Matsuura Saemon, makes his stage appearance from a trapdoor riding a horse. 1st lunar month of 1775: Kôshirô plays in the same theater the roles of Chihara Sakon, Kashima Saburô, Umegaya Yoshibei and Kyô no Jirô in the new year program "Shida Yuzuriha Hôrai Soga". 5th lunar month of 1775: Kôshirô plays in the same theater the roles of Matsuômaru and Kakuju in the drama "Sugawara Denju Tenarai Kagami". His stage partners are Ichikawa Danjûrô V (Matsuômaru's master Fujiwara no Shihei, Kan Shôjô), Iwai Hanshirô IV (Sakuramaru), Bandô Mitsugorô I (Umeômaru, Genzô), Sawamura Chôjûrô IV (Matsuômaru's father Shiratayû), Azuma Tôzô II (Tatsuta no Mae), Nakamura Noshio I (Matsuômaru's wife Chiyo) and Sakata Kônosuke (Princess Kariya). 8th lunar month of 1775: Kôshirô plays in the same theater the roles of Yamana Saemon and Nagoya Sanzaburô in the drama "Keisei Tsuki no Miyako". 11th lunar month of 1775: Kôshirô moves to the Ichimuraza and plays in the kaomise drama "Oyafune Taiheiki". His stage partners are Ichikawa Ebizô III, Iwai Hanshirô IV, Ichikawa Yaozô II and Nakamura Noshio I. This kaomise is a huge success, starting the 1st day of the 11th lunar month and ending the 15th day of the 12th lunar month. 1st lunar month of 1776: Kôshirô's rank in the Edo hyôbanki, tachiyaku section, is jô-jô-kichi (superior - superior - excellent). He plays in the same theater the roles of Chichibu no Shôji Shigetada and Soga Jûrô Sukenari in the new year drama "Kamuri Kotoba Soga no Yukari"; the roles of Soga Gorô Tokimune and Kudô Saemon Suketsune are played by Ichikawa Yaozô II and Ichikawa Ebizô III. 3rd lunar month of 1776: Kôshirô's rank in the Edo hyôbanki, tachiyaku section, is jô-jô-kichi (superior - superior - excellent). He plays in the same theater the role of the shirozake seller Shinbê in the drama "Sukeroku Yukari no Hatsuzakura". The roles of Sukeroku, Agemaki and the villain Ikyû are played by Ichikawa Yaozô II, Iwai Hanshirô IV and Sakata Hangorô II. The performance is a huge success and a long run. 11th lunar month of 1776: Kôshirô moves to the Moritaza and plays the roles of Hakata Rozaemon, Masanari and Tamaya Shinbê in the kaomise drama "Hikitsurete Yagoe Taiheiki". 1st lunar month of 1777: Kôshirô is in the Edo hyôbanki the kanjiku for tachiyaku actors. Summer 1777: the book "Yakusha Sensakuron" ("About actors prying") is published in Edo. It gives some private information on actors. Edo readers learn that Kôshirô lives in the district of Sakai-chô and his annual salary is 800 ryô. 11th lunar month of 1777: Kôshirô moves to the Nakamuraza and plays in the kaomise drama "Masakado Kanmuri no Hatsuyuki". His stage partners are Ichikawa Danjûrô V, Yoshizawa Sakinosuke III and Bandô Mitsugorô I. 2nd lunar month of 1778: Kôshirô plays in the same theater the roles of Chichibu no Shôji Shigetada, Takemura Sadanoshin and Oniô Shinzaemon in the new year program "Kaidô Iro Yawaragi Soga". 7th lunar month of 1778: premiere at the Nakamuraza of the play "Date Kurabe Okuni Kabuki"; Kôshirô plays the roles of Hanyûmura Yoemon, Kizu no Kansuke, Nagoya Sanza, the sumô wrestler Kinugawa Tanizô and Watanabe Minbunosuke [casting]. 8th lunar month of 1778: the "Kôshirô Impeachment affair" shakes the Kabuki world. The growing influence of Ichikawa Danjûrô V in the patrons organizations or the shibai jaya circles created some enmities and a group of people plotted in the shadows to get him accused of misappropriation of funds. Ichikawa Danjûrô V is ordered to leave the stage for a while, give his name to Ichikawa Kôshirô and take the name of Ichikawa Ebizô. The widow of late Ichikawa Yaozô II, who is also the lover of Ichikawa Danjûrô V, leads him to think that both Iwai Hanshirô IV and Kôshirô are responsible for this dirty and complicated plot. Ichikawa Danjûrô V lets his anger explode twice on stage in front of the audience: the 27th of August he accuses Kôshirô and the 28th it is the turn of Iwai Hanshirô IV. As a consequence, Ichikawa Danjûrô V decides to leave the Nakamuraza. 11th lunar month of 1778: Kôshirô becomes zagashira at the Nakamuraza and plays the roles of Sano Genzaemon Tsuneyo and Aoto Magosaburô Fujitsuna in the kaomise drama "Motomishi Yuki Sakae Hachinoki", which celebrates the shûmei of Yoshizawa Ayame IV and the first stage appearance of Bandô Mitahachi I. 1st lunar month of 1779: Kôshirô plays in the same theater the roles of Kudô Saemon Suketsune and Gunsuke in the new year program "Gohiiki Nennen Soga". 3rd lunar month of 1779: Kôshirô plays in the same theater the role of the shirozake seller Shinbê in the drama "Sukeroku Sato no Yozakura". The roles of Sukeroku, Agemaki and the villain Ikyû are played by Ichikawa Monnosuke II, Iwai Hanshirô IV and Ôtani Hiroemon III. 5th lunar month of 1779: Kôshirô plays in the same theater the roles of Kan Shôjô and Matsuômaru in the drama "Sugawara Denju Tenarai Kagami"; the roles of Umeômaru and Sakuramaru are played by Bandô Mitsugorô I and Ichikawa Monnosuke II. 11th lunar month of 1779: as a consequence of his troubles with Ichikawa Danjûrô V, Kôshirô moves to the Ichimuraza and plays the role of Kanesuki in the kaomise drama "Azuma no Mori Sakae Kusunoki", which celebrates the shûmei of Azuma Tôzô III and Segawa Otome. 1st lunar month of 1780: Kôshirô plays in the same theater the roles of Kyô no Jirô, Yawata no Saburô and Kaminari Tsurunosuke in the new year drama "Ume Goyomi Akebono Soga". 5th ~ 6th lunar months of 1780: big troubles at the Ichimuraza! Onoe Kikugorô I leaves the theater after a terrible quarrel with Kôshirô and there are some serious management troubles (the theater can't pay the actors). 11th lunar month of 1780: Kôshirô plays at the Ichimuraza in the kaomise drama "Mure Takamatsu Yuki no Shirahata". 3rd lunar month of 1781: Kôshirô plays in the same theater the role of Obiya Chôemon in the Tomimoto-based dance "Michiyuki Segawa no Adanami"; the role of Chôemon's lover Ohan is played by Segawa Kikunojô III. 9th lunar month of 1781: Kôshirô plays in the same theater the role of Magoemon in the drama "Keisei Koi Bikyaku". 11th lunar month of 1781: Kôshirô plays at the Ichimuraza in the kaomise drama "Mukashi Otoko Yuki no Hinagata", which celebrates the shûmei of Matsumoto Sanjûrô and Ichiyama Sukejûrô. The management of the theater has to struggle hard to find the money to pay the actors. Kôshirô's stage partners are Iwai Hanshirô IV, Yoshizawa Ayame IV, Nakamura Sukegorô II, Ichimura Uzaemon IX, Nakayama Tomisaburô I, Sakata Hangorô II, Sawamura Chôjûrô IV and Onoe Monzaburô I. 1st lunar month of 1782: Kôshirô plays in the same theater the role of Matsuômaru in the drama "Sugawara Denju Tenarai Kagami"; the roles of Umeômaru and Sakuramaru are played by Onoe Monzaburô I and Ichiyama Sukejûrô. 2nd lunar month of 1782: Kôshirô plays in the same theater the roles of the sumô wrestler Kinugawa Tanizô and the yakko Gunsuke in the drama "Sumidagawa Yanagi no Dateginu". 5th lunar month of 1782: Kôshirô plays in the same theater the role of the shirozake seller Shinbê in the drama "Sukeroku Yukari no Edo Zakura". His stage partners are Ichimura Uzaemon IX (Sukeroku), Iwai Hanshirô IV (Agemaki) and Sakata Hangorô II (Ikyû). 6th lunar month of 1782: casting change in "Sukeroku Yukari no Edo Zakura"; Kôshirô replaces Ichimura Uzaemon IX in the prestigious role of Sukeroku and his son Ichikawa Komazô III plays the role of Shinbê. 9th lunar month of 1782: Kôshirô plays in the same theater the roles of the tôfu maker Goroemon and the king of thieves Ishikawa Goemon in the drama "Hama no Masago Otogi Zôshi". 11th lunar month of 1782: Kôshirô plays at the Ichimuraza in the kaomise drama "Ise Heiji Eika Goyomi". 6th lunar month of 1783: Kôshirô plays in the same theater the roles of Ôboshi Yuranosuke and Hayano Kanpei in the drama "Kanadehon Chûshingura". 11th lunar month of 1783: Kôshirô moves to the Moritaza and plays in the kaomise program "Ono no Terusaki Yuki no Akebono". 1st lunar month of 1784: Kôshirô plays in the same theater the role of Fujiya Izaemon in the drama "Haru no Yo Shôji no Ume"; the role of Izaemon's lover Yûgiri is played by the Kamigata actor Mimasu Tokujirô I. 2nd lunar month of 1784: Kôshirô plays in the same theater the roles of Kudô Saemon Suketsune, the warrior Taira no Kagekiyo and Oniô Shinzaemon in the drama "Haru Goyomi Nigiwai Soga". 3rd lunar month of 1784: Kôshirô plays in the same theater the role of Kameya Chûbê in the drama "Keisei Koi Bikyaku"; the role of Chûbê's lover Umegawa is played by Mimasu Tokujirô I. He also plays the role of Mohei in Chikamatsu Monzaemon's drama "Daikyôji Mukashi Goyomi"; the role of Mohei's lover Osan is played by Mimasu Tokujirô I. 4th lunar month of 1784: Kôshirô plays in the same theater the role of the yakko Gunsuke in the drama "Sumidagawa no Meishoki". 7th lunar month of 1784: Kôshirô plays in the same theater the roles of Sagisaka Sanai and the yakko Ippei in the drama "Koi Nyôbô Somewake Tazuna". 9th lunar month of 1784: Kôshirô celebrates his coming departure from Edo by playing in the same theater the role of Obiya Chôemon in the drama "Tagasode Futatsu Nishikie"; the role of Chôemon's lover Ohan is played by Mimasu Tokujirô I. Fall 1784: Kôshirô and Iwai Hanshirô IV go together to Ôsaka. 11th lunar month of 1784: Kôshirô plays in the kaomise drama "Naka ni Môketa Otogo Kaomise", which is produced by Nakamura Kumetarô II at the Naka no Shibai. Kôshirô is not very well welcomed by the Ôsaka audience and Onoe Kikugorô I's son Onoe Ushinosuke I, who works at the Kado no Shibai as a zamoto, makes a scornful speech on stage against Kôshirô, the "frightening uncle from Edo in the little hut next door". 1st lunar month of 1785: Kôshirô's rank in the Ôsaka hyôbanki, tachiyaku section, is jô-jô-kichi (superior - superior - excellent). 4th lunar month of 1785: Kôshirô plays in the same theater the roles of Sasaki Rokkaku, Ukiyo Watahei and Watari Kanpei in the drama "Zen'aku Onna no Tsutsushimigusa". He also plays the role of Kameya Chûbê in the drama "Kurikaeshi Koi Bikyaku"; the role of Chûbê's lover Umegawa is played by Iwai Hanshirô IV. 5th lunar month of 1785: Kôshirô plays in the same theater the role of Sasaki Moritsuna in the drama "Na ni Ôsaka Kôraiya Bashi". He also plays the role of Kameya Chûbê in the michiyuki "Meido no Wakarezato"; the role of Chûbê's lover Umegawa is played by Iwai Hanshirô IV. Summer ~ Fall 1785: Kôshirô plays at the Kita-Horie Ichi-no-Gawa Shibai (Ôsaka) the role of Obiya Chôemon in the drama "Katsuragawa Renri no Shigarami". He also plays the roles of Genta and Shigetada in the drama "Hirakana Seisuiki". Winter 1785: Kôshirô plays in Kyôto. It seems he is not very well welcomed by the audience. 1st lunar month of 1786: Kôshirô's rank in the Kyôto hyôbanki, tachiyaku section, is jô-jô-kichi (superior - superior - excellent). 1st lunar month of 1786: Kôshirô plays at the Kita-Horie Ichi-no-Gawa Shibai (Ôsaka) the role of Nagai Uma-no-Kami Nobuaki in the drama "Ôtô-no-Miya Asahi no Yoroi". 2nd lunar month of 1786: Kôshirô plays in the same theater the role of Tsukimoto Enshû in the drama "Akiba Gongen Kaisen Banashi". He also plays the role of Fujiya Izaemon in the drama "Yukari no Tsuki"; the role of the courtesan Yûgiri (Izaemon's lover) is played by Sawamura Kunitarô I. Spring 1786: Kôshirô goes back to Edo. 5th lunar month of 1786: Kôshirô joins the Kiriza and becomes reconciled with Ichikawa Danjûrô V, ending a nine years long quarrel. 8th lunar month of 1786: Kôshirô plays in the same theater the role of Nagoya Sanza in the drama "Muromachi Onna Bunshô". His stage partners in the roles of Fuwa Banzaemon and the courtesan Katsuragi are Ichikawa Danjûrô V and Segawa Kikunojô III. 9th lunar month of 1786: Kôshirô plays in the same theater the role of the tedai Yodoya Shinshichi in "Kôrai Giku Ukina no Irozashi", the second part (nibanme) of "Muromachi Onna Bunshô". 11th lunar month of 1787: Kôshirô plays at the Nakamuraza in the kaomise drama "Yukimizuki Eiga Hana no Hachinoki", which celebrates the shûmei of Ôtani Oniji III. 2nd lunar month of 1788: Kôshirô plays in the same theater the role of Banzui Chôbê in the drama "Keisei Azuma Kagami". 9th lunar month of 1788: Kôshirô plays in the same theater the role of Danshichi in the drama "Tsuki no Tomo Yoi no Miya Gohyakuzaki", whose plot and character belong to the "Natsu Matsuri Naniwa Kagami" world. His stage partners are Sawamura Sôjûrô III (Tokubê) and Ôtani Hiroji III (Sabu). 11th lunar month of 1788: Kôshirô plays at the Nakamuraza the roles of Sen no Rikyû and Mashiba Hisayoshi in Sakurada Jisuke I's kaomise drama "Tôzumô Hana no Edokata", which celebrates the return in Edo of the actor Nakamura Nakazô I. Premiere at the Nakamuraza of the Tokiwazu-based dance-drama "Modori Kago Iro ni Aikata" (commonly called "Modori Kago"); Kôshirô plays the role of Azuma no Yoshirô (in reality Mashiba Hisayoshi) [casting]. 1st lunar month of 1789: Kôshirô's rank in the Edo hyôbanki, tachiyaku section, is dai-jô-jô-kichi (grand - superior - superior - excellent). He plays in the same theater the role of Soga Jûrô Sukenari in the new year drama "Edo Fuji Wakayagi Soga". His stage partners are Nakamura Nakazô I (Kudô Saemon Suketsune), Ichikawa Monnosuke II (Soga Gorô Tokimune) and Ôtani Hiroji III (Asaina). He also plays in duo with Osagawa Tsuneyo II in the dance "Ukina no Irochimaki". From the 11th, Kôshirô plays the role of An no Heibei in the drama "Otokodate Itsutsu Karigane", sharing the stage with Nakamura Nakazô I (Kaminari Shôkurô), Ichikawa Monnosuke II (Gokuin Sen'emon), Ôtani Hiroji III (Hotei Ichiemon) and Ichikawa Komazô III (Karigane Bunshichi). The performance is successful but the audience drops when Nakamura Nakazô I falls ill and has to be replaced. 6th lunar month of 1789: Kôshirô plays in the same theater the role of Ono no Tôfû in the drama "Ono no Tôfû Aoyagi Suzuri". 7th lunar month of 1789: Kôshirô plays in the same theater the roles of Awa Minbu, Akaneya Jirozô and Tanzaemon in the drama "Heike Hyôbanki", which celebrates the 77th, 13th, 37th, 37th, 60th and 7th memorial services of late Nakamura Denkurô I, Nakamura Denkurô II, Kineya Kisaburô VI, Nakayama Kojurô V, Nakamura Denjirô I and Nakamura Denjirô III. 11th lunar month of 1789: Kôshirô plays at the Nakamuraza in the kaomise drama "Komachi-mura Shibai no Shôgatsu". 1st lunar month of 1790: Kôshirô plays in the same theater in the new year drama "Haru no Nishiki Datezome Soga". 3rd lunar month of 1790: Kôshirô plays in the same theater the role of Obiya Chôemon in the drama "Ohan Chôemon"; the role of Ohan is played by Segawa Kikunojô III. 7th lunar month of 1790: Kôshirô plays in the same theater the roles of Yoemon and Amakawaya Gihei in the drama "Chûkô Ryôgoku Ori". 2nd lunar month of 1791: Kôshirô, Ichikawa Komazô III, Matsumoto Yonesaburô I and Matsumoto Kojirô join the Kawarasakiza; Kôshirô plays the roles of Ume no Yoshibê and Kudô Saemon Suketsune in the new year drama "Hatsu Midori Saiwai Soga". 5th lunar month of 1791: Kôshirô plays in the same theater the roles of Tsuribune Sabu, Nan Yohê and Hosokawa Katsumoto in Sakurada Jisuke I's drama "Onna Date Kôraiya Shima", which mixes the "Natsu Matsuri Naniwa Kagami" and "Futatsu Chôchô Kuruwa Nikki" worlds. 11th lunar month of 1791: Kôshirô moves to the Nakamuraza and plays the roles of Hirai no Yasumasa and Banzui Chôbê in the kaomise drama "Nidai Genji Oshi no Gôkyû". 1st lunar month of 1792: Kôshirô plays in the same theater the roles of Dozaemon Denkichi, a Dôjôji temple priest, the sumô wrestler Matsukaze Sehei and Awazu Rokurô Saemon in the new year drama "Sumidagawa Shibai no Ennichi". 1st lunar month of 1793: Kôshirô's rank in the Edo hyôbanki, sôkanjiku section ("all kanjiku"), is goku-jô-jô-kichi (extreme - superior - superior - excellent). 2nd lunar month of 1793: Kôshirô plays at the Ichimuraza the role of Hazuna no Gengorô in the new year drama "Mitsugi Soga Fuji no Kisewata". 3rd lunar month of 1793: Kôshirô plays in the same theater the role of Asagao Sempei in the drama "Sukeroku". 5th lunar month of 1793: Kôshirô plays in the same theater the roles of Ôboshi Yuranosuke and Amakawaya Gihei in the drama "Kanadehon Chûshingura". Fall 1793: the Ichimuraza goes out of business and gives its license to the Kiriza. 11th lunar month of 1793: Kôshirô plays at the Kiriza the roles of the tôfu maker Saburobei, Watanabe Minbu and Hosokawa Katsumoto in the kaomise drama "Matsu no Tayû Yuki no Datezome", whose plot and characters belong to the "Meiboku Sendai Hagi" world. 11th lunar month of 1794: Kôshirô moves to the Kawarasakiza and plays the roles of Bingo no Saburô, Hata Rokurô Saemon, Nagasaki Kageyu Saemon and Kusunoki Hangan in the kaomise drama "Matsu no Misao Onna Kusunoki". 1st lunar month of 1795: Kôshirô plays in the same theater the roles of Kudô Saemon Suketsune and Banzui Chôbê in the new year drama "Shimekazari Kichirei Soga". 5th lunar month of 1795: Kôshirô plays in the same theater the roles of Kakogawa Honzô and Horibe Yajibê in the drama "Kanadehon Chûshingura", which commemorates the 12th anniversary (13th memorial service) of late Onoe Kikugorô I. 9th lunar month of 1795: Kôshirô plays in the same theater the roles of Daihanji no Kiyosumi and Kamatari in the drama "Imoseyama Onna Teikin". 11th lunar month of 1795: Kôshirô plays at the Kawarasakiza the role of Tawara no Tôta in the kaomise program "Fuku Botan Azuma Dairi". The actor Ichikawa Ebizô shares the top of the bill with Kôshirô. 1st lunar month of 1796: Kôshirô's rank in the Edo hyôbanki, tachiyaku section, is shin-jô-jô-kichi (truly - superior - superior - excellent). 3rd lunar month of 1796: Kôshirô plays in the same theater the role of Yuranosuke in the drama "Taiheiki Chûshin Kôshaku". 8th lunar month of 1796: Kôshirô plays in the same theater the roles of Tsukimoto, the boatman Yojirô, Rikyû and Konoshita Tôkichi in the drama "Keisei Suikoden". 11th lunar month of 1796: Kôshirô plays at the Kawarasakiza the roles of Ishikiri no Gorota and Komatsu no Shigemori in the kaomise drama "Itsukushima Yuki no Kaomise". 1st lunar month of 1797: Kôshirô's rank in the Edo hyôbanki, sôkanjiku section ("all kanjiku"), is goku-jô-jô-kichi (extreme - superior - superior - excellent). He plays the roles of Oniô Shinzaemon, Kamaya Takehei and Kudô Saemon Suketsune in the new year drama "Fuji Miru Sato Yawaragi Soga". The roles of Soga Gorô Tokimune and Soga Jûrô Sukenari are played by Ichikawa Komazô III and Bandô Minosuke I. 3rd lunar month of 1797: Kôshirô plays in the same theater the role of the shirozake seller Shinbê in the drama "Sukeroku Kuruwa no Sakurabito". His stage partners are Ichikawa Komazô III (Sukeroku), Nakayama Tomisaburô I (Agemaki) and Onoe Matsusuke I (Ikyû). 5th lunar month of 1797: Kôshirô plays in the same theater the role of Nan Yohê in the drama "Sekitori Shôbu no Katabira", which is similar to "Futatsu Chôchô Kuruwa Nikki". 9th lunar month of 1797: Kôshirô plays in the same theater the role of Hosokawa Katsumoto in the drama "Mitsugimono Shiga no Irifune". 11th lunar month of 1797: Kôshirô moves to the Nakamuraza and plays the roles of Yahei and Miura Heitayû Kunitae in the kaomise drama "Kaikei Kokyô no Nishikigi", sharing the stage with Ichikawa Danjûrô VI, Iwai Hanshirô IV, Ichikawa Komazô III, Onoe Matsusuke I, Nakayama Tomisaburô I, Bandô Hikosaburô III, Nakamura Noshio II, Bandô Minosuke I, Iwai Kumesaburô I and Ichikawa Ebizô V. This kaomise program, which celebrates the reopening of the Nakamuraza, is a huge success. 3rd lunar month of 1798: Kôshirô plays in the same theater the roles of Yawata no Saburô and Chichibu no Shôji Shigetada in the drama "Wakakoma Norizome Soga". 5th lunar month of 1798: Kôshirô plays in the same theater the roles of Hachizô and Date no Yosaku in the drama "Katakiuchi Somewake Tazuna". 8th lunar month of 1798: Kôshirô plays in the same theater the roles of Yonetsuki Hachirobê, Oyamada Tamon and Ukishima Danjô Saemon in the drama "Irifune Shinoda no Dekiaki". 9th lunar month of 1798: Kôshirô plays in the same theater the roles of Yuranosuke and Shinoda Shôji in the dramas "Taiheiki Chûshin Kôshaku" and "Ashiya Dôman Ôuchi Kagami". 11th lunar month of 1798: Kôshirô does not take part in the Nakamuraza kaomise. 3rd lunar month of 1799: Kôshirô plays at the Nakamuraza the role of Ito Kurô Sukekiyo in the drama "Sukeroku Kuruwa no Hanami Doki", which commemorates the 22nd anniversary (23rd memorial service) of late Ichikawa Ebizô III. The roles of Sukeroku, Agemaki and Ikyû are played by Ichikawa Danjûrô VI, Iwai Kumesaburô I and Ichikawa Komazô III. 4th lunar month of 1799: Kôshirô plays in the same theater the roles of Ishidô Umanojô, Amakawaya Gihei and En'ya Hangan in the drama "Kanadehon Chûshingura". The roles of Kô no Moronô and Yuranosuke are played by Ichikawa Komazô III. Ichikawa Danjûrô VI, who plays the roles of Teraoka Heiemon, Ôwashi Bungo and Momonoi Wakasanosuke, falls ill the 18th April and dies the 13th day of the 5th lunar month. The management of the Nakamuraza decides to stop the productions up to the 11th lunar month kaomise. 11th lunar month of 1799: Kôshirô plays at the Nakamuraza in the kaomise drama "Tametomo Yumiya no Oyafune", which celebrates the shûmei of Bandô Mitsugorô III. 1st lunar month of 1800: Kôshirô plays in the same theater the roles of Kyô no Jirô and Chichibu no Shôji Shigetada in the new year drama "Fuji o Mimasu Saiwai Soga". This production is the last stage appearance of Iwai Hanshirô IV, a long time stage partner of Kôshirô. 5th lunar month of 1800: Kôshirô plays in the same theater the role of Kajiwara Heizô Kagetoki in the drama "Yoshitsune Senbon Zakura". 11th lunar month of 1800: Kôshirô does not take part in any kaomise program. 5th lunar month of 1802: Kyôjûrô appears on stage for the last time, at the Ichimuraza, playing the role of Tadayoshi in the drama "Taiheiki Chûshin Kôshaku". Matsumoto Kôshirô IV was one of the best tachiyaku actors of the second half of the eighteenth century, excelling as wagotoshi or jitsugotoshi. He was also a great jitsuaku (in the latter years of his life) and outstanding in sumô wrestlers or otokodate roles. He made a great career but was in trouble many times, especially after the terrible quarrels with Ichikawa Danjûrô V or Onoe Kikugorô I.
Matsumoto Kôshirô IV's best roles: Soga Jûrô Sukenari, Chichibu no Shôji Shigetada, Fujiya Izaemon, Kameya Chûbê, Obiya Chôemon, Banzui Chôbê, Matsuômaru ("Sugawara Denju Tenarai Kagami"), Kinugawa Tanizô and Kudô Saemon Suketsune.